Demel entered EMS in 2002, right after he graduated from Chicago’s Malcolm X College School of Health Sciences. He fell in love with the profession, and went on to earn his Paramedic license in 2006 from St. Francis in Evanston. When he entered management a few years later, he ended up working just a few blocks from his alma mater, providing care and treatment to people in the local community and the Greater Chicago Area. In 2011, Demel took the next step in his career by earning his Critical Care Paramedic license from University of Maryland-Baltimore. 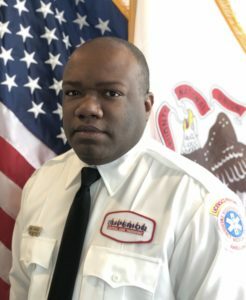 Demel has worked since then as a CCT medic in the Chicago area, and his dedication and professionalism have been recognized by his recent promotion—he now oversees two of Superior’s south suburban stations. Demel has had several cardiac arrest saves in the field, and he has touched countless lives during his career. He has proven that hard work, mixed with dedication and compassion, does a great service not only to the company but—more importantly—to the community. We are proud to nominate him as a 2018 Star of Life.